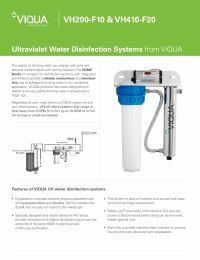 The Viqua VH200-F10 Cobalt Series Ultraviolet System incorporates high-output UV lamp technology coupled with the redesigned Cobalt series chamber, moving the inlet/outlet ports from an axial to S-shaped configuration making it more compact and easier to install. 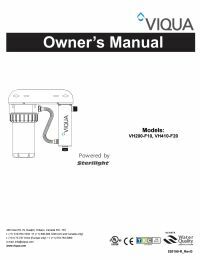 This system adds an integral 5 micron pre-filter to the VH200 system, that is mounted to a steel bracket. 230V systems are shipped with 2-prong continental European (CEE-7/7) 2 pin with ground "Schuko" power cord.